Canadian Tire Hours Locations - 300-202 Veterans Blvd NE Airdrie, 403-948-3993, T4B 3P2. 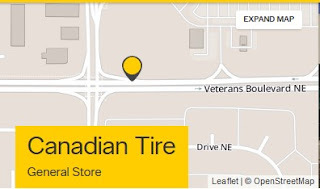 Explore Canadian Tire products and services of Accessories and Service, Automotive Parts, Leisure and home Products, Sports, at this locations. Browse the Canadian Tires Weekly Flyer sales. Then get special offers, coupons and more. You can get latest Canadian Tire Flyer by clicking here.